(Nanowerk News) While a microphone is useful for many things, you probably wouldn’t guess that it could help make movies of molecules or measure physical and chemical properties of a material at the nanoscale with just one poke. Georgia Tech researchers have created a highly sensitive atomic force microscopy (AFM) technology capable of high-speed imaging 100 times faster than current AFM. This technology could prove invaluable for many types of nano-research, in particular for measuring microelectronic devices and observing fast biological interactions on the molecular scale, even translating into movies of molecular interactions in real time. The research, funded by the National Science Foundation and the National Institutes of Health, appears in the February issue of Review of Scientific Instruments. Not only is FIRAT™ (Force sensing Integrated Readout and Active Tip) much faster than AFM (the current workhorse of nanotech), it can capture other measurements never before possible with AFM, including material property imaging and parallel molecular assays for drug screening and discovery. FIRAT could also speed up semiconductor metrology and even enable fabrication of smaller devices. It can be added with little effort to existing AFM systems for certain applications. "I think this technology will eventually replace the current AFM," said >Dr. Levent Degertekin, head of the project and an asscoiate professor in the Woodruff School of Mechanical Engineering at Georgia Tech. "We’ve multiplied each of the old capabilities by at least 10, and it has lots of new applications." FIRAT solves two of AFM’s chief disadvantages as a tool for examining nanostructures — AFM doesn’t record movies and it can’t reveal information on the physical characteristics of a surface, said Dr. Calvin Quate, one of the inventors of AFM and a professor at Stanford University. "It is possible that this device provides us with the ‘ubiquitous’ tool for examining nanostructures," Quate added. And what’s the key to this dramatic increase in speed and capabilities? A completely new microphone-inspired probe. Current AFM scans surfaces with a thin cantilever with a sharp tip at the end. An optical beam is bounced off the cantilever tip to measure the deflection of the cantilever as the sharp tip moves over the surface and interacts with the material being analyzed. FIRAT works a bit like a cross between a pogo stick and a microphone. 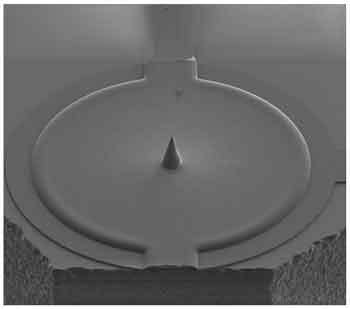 In one version of the probe, the membrane with a sharp tip moves toward the sample and just before it touches, it is pulled by attractive forces. Much like a microphone diaphragm picks up sound vibrations, the FIRAT membrane starts taking sensory readings well before it touches the sample. And when the tip hits the surface, the elasticity and stiffness of the surface determines how hard the material pushes back against the tip. So rather than just capturing a topography scan of the sample, FIRAT can pick up a wide variety of other material properties. "From just one scan, we can get topography, adhesion, stiffness, elasticity, viscosity — pretty much everything," Degertekin said. For a regular AFM to detect the features of the object, the actuator must be large enough to move the cantilever up and down. The inertia of this large actuator limits the scanning speed of the current AFM. But FIRAT solves this problem by combining the actuator and the probe in a structure smaller than the size of a head of a pin. With this improvement, FIRAT can move over sample topography in a fraction of the time it takes AFM to scan the same area. Georgia Tech researchers have been able to use FIRAT with a commercial AFM system to produce clear scans of nanoscale features at speeds as high as 60 Hertz (or 60 lines per second). The same system was used to image the topography as well as elastic and adhesive properties of carbon nanotubes simultaneously, which is another first. FIRAT’s new speed and added features may open up many new applications for AFM. For instance, FIRAT is capable of scanning integrated circuits for mechanical and material defects. And in biomolecular measurement applications, FIRAT can scan the surface quickly enough for a researcher to observe molecular interactions in real time. "The potential is huge. 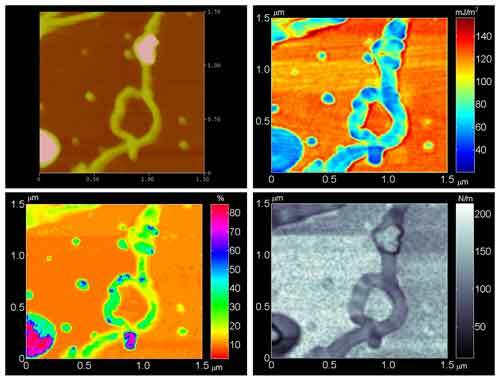 AFM started as a topography tool and has exploded to many more uses since. I’m sure people will find all sorts of uses for FIRAT that I haven’t imagined," Degertekin said. FIRAT will be available for certain applications immediately, while others may take a few years, Degertekin said.